Milgard Style Line Series Windows & Doors were the low cost option chosen by the Apartment Complex owner for the multi-family units in North Orange County, CA. A New View Windows and Doors sells and installs replacement windows for apartment buildings, multi-family units, commercial buildings, and apartments throughout Orange County and LA County, in addition, to other Southern California and Northern California areas. It is a growing part of our Commercial Services. Multi-Family Dwelling – North Orange County, CA. In the images, you will see aerial and up-close views of the completed project. This apartment complex project required comprehensive commercial window and door services from the preliminary quote, door and window measurements, meeting budget specs, and selection of style and color. Installation services including project management and install of vinyl replacement windows and vinyl patio doors throughout the apartment complex. For this North Orange county commercial project, we installed Milgard Styleline Series Windows & Patio Doors. This project was a retrofit installation. In this North Orange County commercial project the use of retrofit was an affordable and good solution for replacement as these windows and doors are not as exposed to extreme elements/exposure due to the structural design and building style. Style Line® Series Vinyl Windows and Patio Doors by Milgard provide an affordable option for low cost replacement windows for apartments. In addition to installations for apartments, townhouses, and multi-family unit buildings these vinyl windows and patio doors are also frequently a choice in residential properties because of their durability. Milgard’s Style Line® Vinyl Windows come in neutral color tones. The available operating Styles include the following: Awning Windows, Single-Hung and Horizontal Slider Windows, Casement Windows, Picture and Radius top windows. Milgard’s Style Line® Vinyl Sliding Patio Doors with a slim profile design. 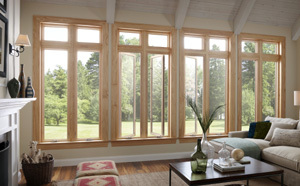 Style Line Series vinyl windows narrow frames allow for more light in the visible glass area. The slim-profile by design minimizes obstructed views between two windows installed next to each other. It is a popular choice when you want a sleek and contemporary look. The frames are currently available in select neutral colors that blend with softer interior and exterior color tones. Some of our most pleased customers that purchase replacement windows include property owners and managers, and builders doing renovations. We provide windows, doors, and installation services for low-rise buildings including apartments, condos and townhouses, as well as multi-family units, city buildings, church and school buildings. Look at our portfolio pages for additional close-up photos of this North Orange County project and more commercial projects. If you have questions or want to set up a day and time for a Free Estimate at the job site, please call us at (714) 953-7663 or use our contact form to get started on a quote. You are welcome to visit our showroom, A New View Windows & Doors located in Anaheim or we can arrange for our staff to come to your job-site. A New View Windows & Doors located in Orange County has been in business since 2001, over 17 years of experience. We are certified dealers for top manufacturers such as Andersen, Marvin and Milgard, JELD-WEN, Therma-Tru and Simpson windows and doors. We also sell and install James Hardie Siding, Norman Plantation Shutters, and Window Shades.